Tropical Storm Cindy has strengthened in the central Gulf of Mexico, and it will be a soaker, bringing potentially life-threatening flooding concerns to parts of the Gulf Coast through late this week. Gusty winds, rip currents and isolated tornadoes are also expected. A tornado watch is in effect for southern Alabama, southern Louisiana, southern Mississippi and the Florida Panhandle until 10 a.m. CDT. This watch area includes New Orleans, Mobile, Alabama, and Pensacola, Florida. A tropical storm warning has been issued from San Luis Pass, Texas, to the Alabama-Florida border, including Lake Pontchartrain, which means tropical storm conditions are expected within 36 hours. This warning area includes New Orleans, Houston, Galveston, Texas, Lake Charles, Louisiana, Lafayette, Louisiana, Biloxi, Mississippi, and Mobile, Alabama. Tropical storm conditions are expected to first reach the coast within the warning area by early Wednesday and spread westward within the warning area through early Thursday. Satellite imagery shows vigorous shower and thunderstorm activity in the northern Gulf of Mexico and along the Gulf Coast. That stormy weather is located mainly to the north and east of the low-pressure center, which is over 200 miles south of Morgan City, Louisiana. 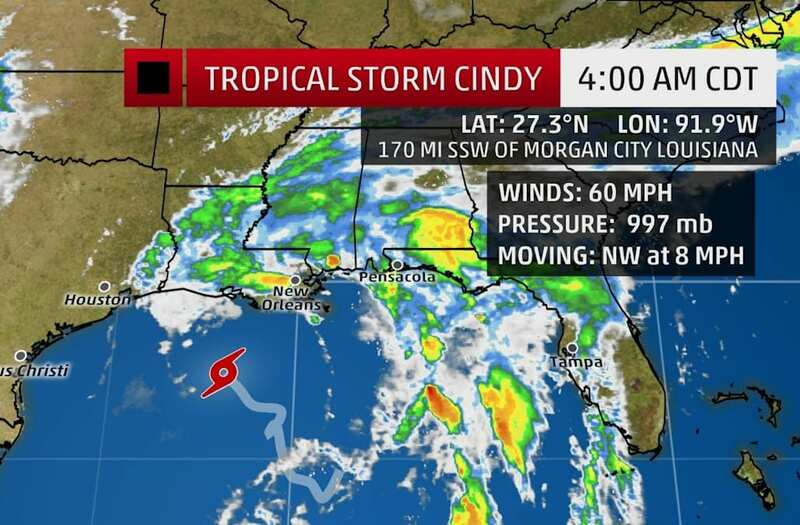 Cindy is expected to move northwestward and approach the coasts of southwest Louisiana and southeast Texas late Wednesday into Wednesday night, before moving inland over southeast Texas on Thursday. It's important to not focus completely on the forecast path of the low-pressure center since impacts will extend well to the east along the Gulf Coast. Parts of southeast Louisiana, southern Alabama, southern Mississippi and the Florida Panhandle are not in the forecast path but are expected to see a substantial amount of rain, which could cause life-threatening flash flooding. Water-covered streets and interstates were reported in parts of the Atlanta metro area Tuesday afternoon. Florida was the first area to experience this influx of moisture, resulting in heavy downpours on Monday. The northern Gulf Coast will see heavy rain from Cindy through Thursday. This heavy rain could eventually lead to life-threatening flash flooding and river flooding in some areas. The heaviest rain amounts are likely to be on the northern Gulf Coast, including parts of southeast Louisiana, southern Mississippi, southern Alabama and the Florida Panhandle. This swath could see 6 to 9 inches or more of total rainfall by Thursday. Locally extreme rain amounts of 12-plus inches could occur in localized areas, according to the National Hurricane Center. Life-threatening flash flooding and river flooding are both likely threats. Other parts of the South, including the Florida Peninsula, will also see locally heavy rain at times this week due to the abundant moisture and stalling front. Heavy rain could occur as far west as southeast Texas through Thursday. The rain could linger into Friday. A high risk of rip currents is likely along parts of the Gulf Coast. High surf and some coastal flooding are also expected. Inundation of 1 to 3 feet above ground level is possible along the coast in the tropical storm warning area, with isolated areas possibly up to 4 feet. Gusty winds are likely near parts of the northern Gulf Coast this week, particularly north and east of where the low tracks. Isolated tornadoes are also possible through Wednesday from southern Louisiana to the Florida Panhandle.